Fancy a night of laughter and comedy or fancy yourself as a stand up comedian? Then why not join our amazing ‘Stand Up For Cider’ comedy nights throughout Jan, Mar, May & July 2017 in association with Invest South West. You’ll get the chance to see 6-10 comedians each night, a professional MC comedian and a professional headline act, and be part of one of the most exciting events in Taunton, Tickets just £9. Each show is hosted by a Professional MC Comedian plus the involvement of 1 or 2 ‘local celebrities’ that have the courage to try their hand at stand up comedy! These will be joined by 4 or 5 South West Circuit comedians who are not currently full time professionals but are doing well….and to finish each show will be a Top Class Headline Comedian to close the show and announce the winner and runner up in each heat. Audience members will be given 2 different tokens on arrival – a 1st and 2nd choice which they will use for voting. The MC will have 2 tokens too and his will be the deciding votes. It really will be a scream!! 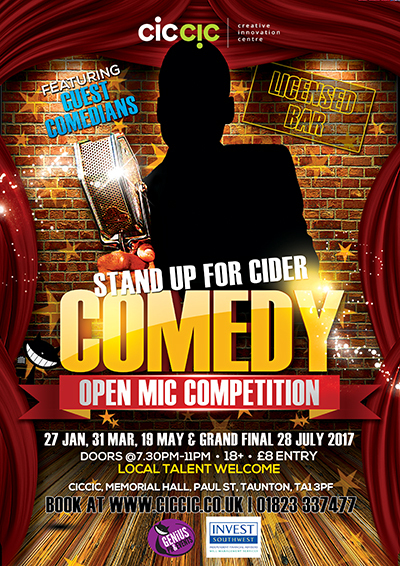 “Stand Up For Cider” is a friendly competition style show in which acts are given 10 minute open spots. The audience vote for their favourite and second act, and the winner is presented with the trophy for the night, (which will eventually be engraved with names of all the winners), and invited back for paid work at one of Genius PR’s other shows. As well as being invited to compete in the Grand Final all competitors must be able to commit to being available for the 28th July.